Porcelain Slabs | Italian Marble & Granite, Inc.
Everyone is loving quartz right now, with colors that resemble natural stone particularly on trend. But when it comes to replicating a marble look, quartz cannot compare to porcelain slabs. 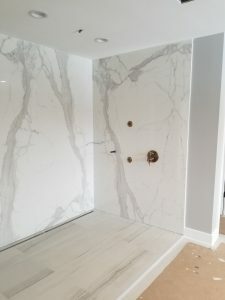 Porcelain slabs have been breaking into the market the last couple of years and the resemblance to marble is remarkable. Since porcelain is 12mm thick it is ideal for vertical applications. Porcelain is great for use on a fireplace, shower, or full height backsplash. Porelain can be used for kitchen counter tops, though it is only 12mm thick. In order to replicate the look of a thicker counter top, a mitered edge can be applied to the procelain.